DOHA, Oct 23 (APP): President Mamnoon Hussain Sunday said with the economy gaining strength, terrorism subsided and energy crisis being effectively tackled, Pakistan had changed a lot over the last three and half years due to government’s right direction and priorities, and was far better than past few years. “But I want to give you good news that due to right direction and untiring efforts over the last few years, a big change has occurred. With the grace of Almighty Allah, the situation today is far better,” the President said while addressing a gathering of the Pakistani community in Qatar. 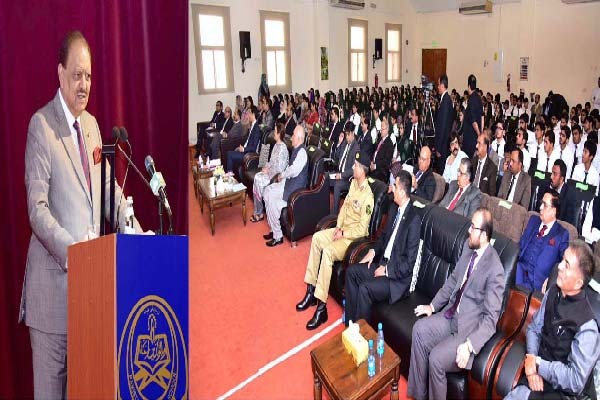 He said the law and order situation in tribal areas, Karachi and Balochistan had returned to normalcy to a large extent, due to the actions being taken in various parts of the country under the National Action Plan to tackle the issue of extremism and terrorism. The President said the government was committed to continue all actions including the Operation Zarb e Azb till the complete elimination of terrorism from the country. He said with the boom being witnessed in trade activities, the revival of peace had also put positive impact on the country’s economy which was an encouraging development, and had also given a sigh of relief to masses. The President said besides the fragile law and order situation that had reduced trade activities and hampered the flow of local and foreign investments, weak economic strategy and unattractive investment policies were among the main reasons behind economic slow down. But now, he said Pakistan was the only country in region that provided investment friendly laws under which there was no bar on foreign investors for holding complete equity and transferring their profits abroad. Similarly, the President said, local investors in Pakistan were also being encouraged through attractive incentives. He said it was due to these policies of the government that economic indicators were fast improving, production and exports were increasing, inflation had been curbed to a large extent and benefiting the common man directly through decreased prices. The President was confident that the situation would improve further in the coming days, as national economy would further flourish and people would become more prosperous. He, in this respect, appreciated the Pakistani expatriates whose remittances contributed a lot in giving strength to the country’s economy. “That’s why I often say that Pakistan has become heaven for investors in the region,” he remarked. The President further said he believed that after the implementation of China Pakistan Economic Corridor (CPEC), situation would improve remarkably and the country would attract historic investment in different fields. Describing CPEC a revolutionary project, he said, it would help Pakistan to become a center of international trade. This project would not only give strength to Pakistan’s economy but to that of the whole region. The standard of living would improve and mutual cooperation and links would further strengthen, he added. He said CPEC did not comprise a few roads, but various power generation projects were also part of it. Besides the construction of different dams, electricity would be generated through various means including atomic, wind and coal fired power projects. The President hoped that with the activation of these projects and addition of 10,000 MWs in the national grid during the next one and half years, power load shedding in the country would end completely by 2018, or would be nominal. “It is also expected that due to higher power generation, electricity tariff would record notable decrease,” he added. The President said February 2016 Pakistan Qatar agreement on Liquid Natural Gas (LNG) under which the import of LNG from Qatar had already started also played an important role in tackling energy crisis in the country. Mamnoon Hussain said after taking oath as the President of Pakistan it was his first visit to Qatar, but during this period he had held various meetings with Qatari leadership and would be holding more. The President said he was highly impressed with the sincere feelings which the Qatari leadership had for Pakistan and he believed that the relations between the two brotherly countries would further expand. President Mamnoon Hussain was glad to note that the State of Qatar was fully aware of the services being rendered by Pakistani community and valued it saying that he was proud of it. He urged the Pakistani community to infuse further warmth in their relationship with the Qatari brethren and strive to create more space for them in their hearts by abiding by the local rules and traditions, as every Pakistan expatriate was considered as his country’s envoy.